With my son preparing to go to college in a little more than a year, I have been thinking about my own journey from living at home with my parents to becoming an adult. Part of this transformation involved going from having no debt and no real financial obligations to being loaded down with all sorts of payments and bills. As I look back, I realize that there are several bridges I crossed on the way from going to having no debt to having a significant amount of debt. A common bridge on the road to debt is student loans. Most students who go to college will end up taking student loans. College is expensive, and young people typically do not have that much money, so many college students are going to take out loans to get through college. I crossed this bridge myself in graduate school. For me, getting a loan to complete graduate school turned out to be a good investment. I bet I have already made more than 1 million dollars more than I would have without going to graduate school. That is a heck of a return on investment! But student loans do represent a bridge on the road to increasing debt. I think getting student loans softened me up to the idea of borrowing money to buy things using credit. Another bridge I crossed on the road to debt was when I started using credit cards to buy things. I got a few credit cards as an undergraduate in college, but only used them enough to get free stuff. Later, when I got engaged, I got the first credit card that I really used- a Zales jewelry store credit card that I used to buy the engagement ring and wedding ring. It felt great to be able to buy these rings, and the payments were only around $72 per month! This early experience with credit card reinforced how easy it was to sign my name and get what I wanted immediately, without having money saved up. Since then, I have had many credit cards and have purchased many things with credit. The first car that I bought on my own was a four year old Ford Explorer, back when SUV’s were really popular. This was a great car. I made payments on it for four years and drove it for about 10 years. I have paid cash for cars a few times since then, but I have also taken out car loans a few times. Another bridge I crossed on the road to debt was mortgage loans. As a young adult, I lived in dormitories or rented apartments. I remember feeling some anxiety of going from no obligation to being responsible for paying rent every month. This obligation increased when I bought a house with a 30 year mortgage. I remember the loan officer assuring me that we wouldn’t be paying on this mortgage for 30 years, and she was right. We bought a bigger house after about 3 years. I think my own progression of crossing bridges to go further into the land of debt is fairly typical. Young adults will leave home, take student loans, start using credit cards, get a car loan, and get a mortgage to buy a house. Once you cross a bridge, it is easy to continue on with that type of spending and debt. After you take one semester of student loans, it is natural to take another. After you get your first credit card, it is hard not to get another one. If you have car payments already, it is easy to take another car loan- you can make the same monthly payment and drive a newer car! If you are already paying a mortgage, it doesn’t seem like much of a change to buy a bigger house and pay a little bit more every month. Living with a lot of debt is not sustainable forever. You might reach a point where your borrowing power is maxed out and you just can’t get any more credit to keep on spending. You might have a decrease in income or a sudden expense and not be able to keep making all of your debt payments. You might start seeing people not that much older than yourself retiring and realize that you won’t be able to keep making big loan payments forever. Maybe you see an opportunity that would require some time and money to pursue and realize that you have no real freedom to change course. There are bridges you cross on the road into debt. These bridges make it easy to go further into debt. When you decide to turn around and leave debt behind, you realize that there are no bridges on the way out. You have to swim across. You can get into a car loan for $30,000 in about 30 minutes. You can get out of a car loan for $30,000 in 48 months, or maybe 60 months or even 72 months. It is easy to cross bridges into debt, but very difficult to get out. So how do you get out? The first step is to decide to turn around and go the other way. This may be the hardest part. 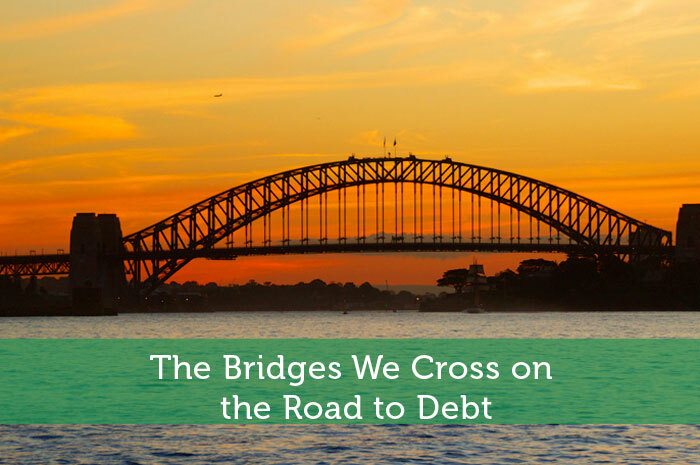 It is hard to make the choice to turn around- crossing bridges to get into debt is so much easier than the hard swimming that is required to get out. Instead of getting more credit cards, you focus on paying down credit cards and starting to get rid of them. Instead of getting another car loan, you focus on trying to pay your car off and keep driving it as long as you can. Instead of buying more things, you see what things you can sell and use the money to pay down debt. All of these things are easy to say, but hard to do. In order to be successful at spending less and getting out of debt, you need to find ways to spend less both on big purchases and on small daily expenses. Every dollar counts the same. The dollar you save by not getting a coffee at Starbucks counts the same a dollar you save by paying less interest on a credit card that you have started to pay down. Over the past two years, as I started to think seriously about ways to spend less, I wrote about this on my blog, Penny Pincher Journal. I even published two books on ways to spend less money. I thought that people looking for ways to save money might not want to buy a book, so one of these books is free. Have you turned around and started to swim yet, or are you still crossing bridges on the road into debt? Today’s guest post is by Dr. Penny Pincher at Penny Pincher Journal. In 2013, Dr. Penny Pincher bought a puppy on impulse that changed his life. He realized he would have to quickly find ways to spend less money to cover this unplanned expense. He started searching for ways to spend less money and sharing penny pinching tips on his blog. You might wonder if Dr. Penny Pincher is really a doctor… yes he is- with a Ph.D. in engineering. I like using the bridge as a symbol of a debt payoff. The car loan is definitely the most striking example, as it’s very easy to get into a new car in just a few hours. But it will most likely take 5 years to actually cross that bridge! Bridges make sense to me when thinking about going into debt, because when we reach a bridge we have a clear choice of whether to cross or not. The bridge makes it easy to cross further into debt. All you have to do is sign your name and cross. The bridge of credit cards was the worst for me. It’s amazing how quickly you can get over the bridge only to find yourself with lots of nice things, but a wealth of debt that takes years to pay off. Credit card companies sure do make it easy to get credit cards. I get at least one credit card application offer in the mail every day! I had that 5 year car loan. Never again. There is not that much difference between a new car and a used car, other than the price… A new car turns into a used car as soon as you drive it off of the car lot! Cars can easily last over 200,000 miles now- this is how far I have driven both of my last two cars and I hope to surpass this with my current car. I have a friend who is dealing with car loan and credit card debts! She keeps on complaining about it, but still continues to use her credit cards. It’s important to educate our kids before they head off on their own about the potential dangers and pitfalls of debt. That wasn’t done in my case, and got myself in a little bit of trouble with debt in college. We need to do a better job of preparing our young people for managing their own finances. Sometimes it is better to get burned a little and learn a lot… Some things have to be learned the hard way, and for some people, I think the hazard of debt is one of those things. If bridges are on the road to paying off debt, I’ve been slowly crossing each one over the last few years. The car may have been the best to cross as I sold it at a small loss, but broke even 3 months later on the monthly payment/insurance/gas/maintenance that was coming out. Selling a car does have a domino effect and leads to lots of other savings. I tell people with two cars in their family to think about selling one if they can- this eliminates a car payment, insurance, plus less gas too. Car loans have always been confusing for me. I am in sales and I travel around, so isn’t it better for me to buy my car on a loan and use a portion payments as a tax deduction for my salary? You might be able to buy a car with cash as a business expense and depreciate it over multiple years on your taxes. I would check with your tax preparer or accountant on this one. If you can buy the car with cash instead of a loan, you would be saving a few percent interest per year, which could be over $1,000 per year.